Editor’s Note: This post originally appeared on the Erb Perspective blog, a publication of the Frederick A. and Barbara M. Erb Institute at the University of Michigan. Local food initiatives have taken off across the country in recent years. Registered farmers markets, for example, expanded nationally from around 3,000 in 2000 to over 8,000 in 2012, and urban farming has exploded across neighborhoods, at schools and in healthcare facilities -- with more than 1,200 community gardens across Detroit alone. 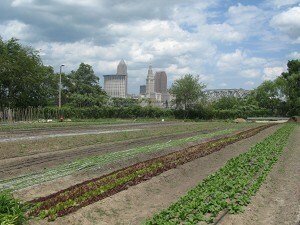 In an attempt to promote its benefits and mitigate its drawbacks, cities across the country have created new arenas of governance concerned solely with local food. These arenas frequently include legislation around issues such as the production and sale of local produce and cottage foods, the creation of grants and other aid to facilitate local food efforts, and the establishment of food policy councils (over 200 such councils now exist across the U.S.), among many other features. Consider Whole Foods Market's experiences in Detroit and Cleveland, for instance. The company explicitly values and pursues “customer satisfaction, team member happiness and excellence, return on capital investment, improvement in the state of the environment and local and larger community support” but neither explicitly justice nor development. Nonetheless,when seeking to open a Detroit store, Whole Foods Market met with pushback not from any single policy but simply from the established justice values characterizing the local food system there. Consequently, Walter Rob, the company’s co-CEO, reached out to local food justice leaders to figure out how the store might play into “race and gentrification and power in Midtown.” The company then engaged in unprecedented measures to address these issues head-on, including holding community meetings and creating an advisory group of non-profit, government, and community organizations which were “faithful” to “a vision of justice” when engaging the corporation ahead of the store’s Detroit opening. a grassroots social media campaign with over 3,000 members that called for the store to come and “create a huge economic-development opportunity” for the area. According to its regional president, as the company considered opening a new location on Cleveland’s West side it thus, unlike in Detroit, had to focus particularly on “encouraging economic growth”—not justice—in creating a store best designed to meet community demands. Erica Morrell is a PhD candidate in public policy and sociology at the University of Michigan. In research and teaching, she works at the intersection of policy studies, science and technology studies, social movements and the environment with an eye toward political contention and democratic engagement vis-a-vis food systems. Currently she is completing her dissertation on the comparative politics of local food.